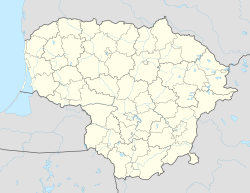 Raguvėlė is a village in Anykščiai district municipality, in Utena County, in northeast Lithuania. According to the 2011 census, the village has a population of 314 people. Village established near Juosta river. ^ "2011 census". Statistikos Departamentas (Lithuania). Retrieved August 18, 2017. This Lithuanian location article is a stub. You can help Wikipedia by expanding it. This page was last edited on 5 March 2018, at 02:37 (UTC).